The problem is that these central supports are flimsy and tend to fall on the side, and I would like to find a way to secure them. For now, I put a pile of books below it, and it's still unsteady. The height of the supports is 23cm. I looked for better solutions (apart from changing the bed). I've tried a few approaches, including supporting it with car jacks. These jacks are ugly and generally too tall (28cm+), so I also attempted to support it with bed risers. 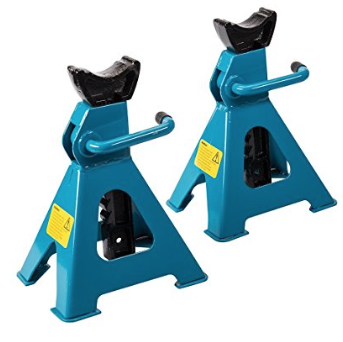 These tend to be too low and not adjustable (15-20cm max). How can I secure the central support, or support it in an adjustable way? The existing supports look to just be a piece of wood stood on end, and fastened into the rail running the length of the bed. The simplest solution would be to build a wider support, also out of wood, and also fastened into that rail. Grab a 2x4, cut it into pieces ~6" long, and stack them until you get the height you need. 6 lengths of 2x4 stacked in this manner should get you the 23cm you need (a 2x4 laying down is only 1.5" thick, and 23cm is 9"). Screw or glue them all together and you're good to go. Orient them perpendicular to the rail for additional stability. A single 8' 2x4 typically seen at the home centers will cost about $2 or $3 (in the US, at least), and a box of screws a few more dollars, making this a very cheap solution. 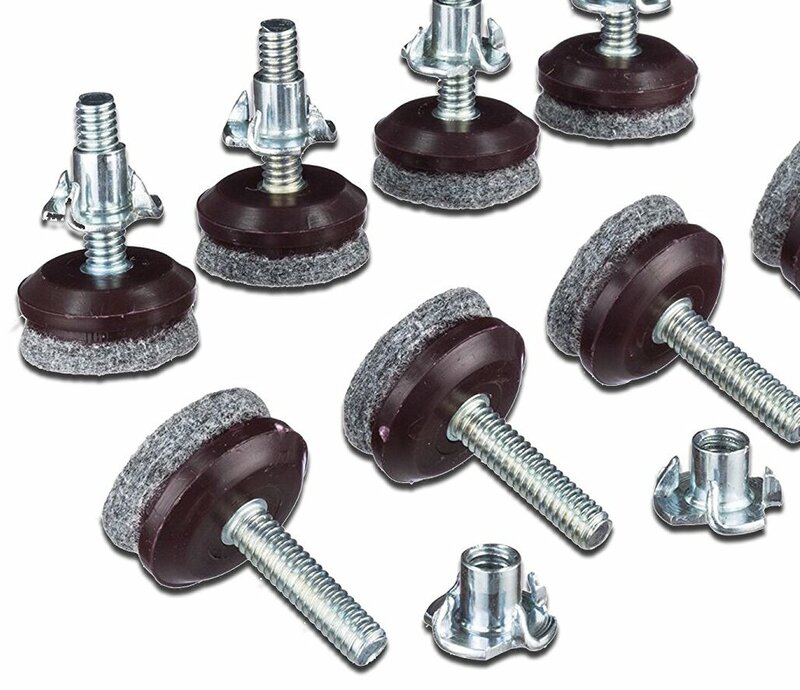 You can make your own adjustable supports from a 4 x 4 or a 2 x 4 or use what you have along with furniture levelers. Install an adjustable leveler in the bottom of them , you drill a hole a little larger than the diameter of the screw/bolt . 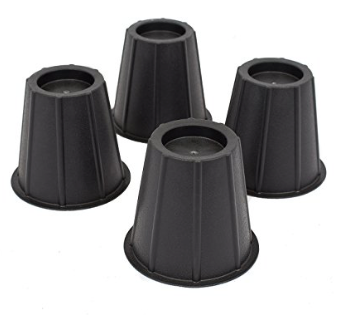 You push the nut into it and hammer it in place - then run your leveling foot into the nut / support. Now you have an adjustable support built to your liking. The main rationale for needing the center support is because the slats are quite thin (appear to be perhaps 1/2" or ~12.7mm). An alternative may be to transfer more of the mattress + occupant weight to the side rails by using thicker slats. One approach is to replace the existing slats with something like a 2x4 (which is 1-1/2" or about ~40mm) lying flat on its side. Whenever I've refurbished an older bed frame I've always done it that way and it makes it extremely strong & rigid. I recommend carefully picking out 2x4s which are fairly smooth and without significant twist, curves, etc. which is typical of construction lumber. You would have to trust that the side rails & consequently footboard & headboard assemblies would take the additional weight. There has to be enough depth of the side rails to hide the 2x4s. Not the answer you're looking for? Browse other questions tagged bedroom support or ask your own question. Do I need a box-spring for my bed? How can I improvise a kids double bunker bed? 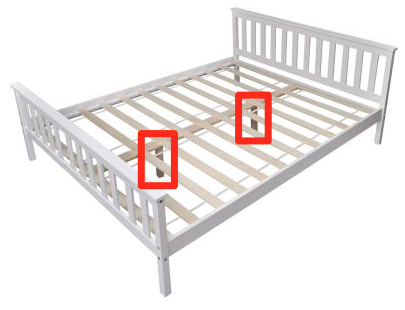 How to fix bed slats? Vertical loft supports doing nothing? is my murphy bed doable and safe?